The Pelican 2680 HeadsUP Lite® provides hands free light right where you need it, when you need it. 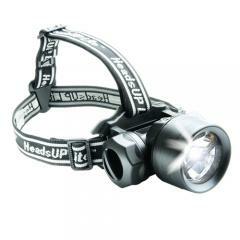 HeadsUP Lite® 2680 is an LED flashlight that's just as bright as a high performance incandescent, without the annoying dark spots and irregular beam pattern caused by standard filament lamps. That's Recoil LED Technology. Here's the secret: by pointing the LED backwards into the reflector, 100% of the light is captured and projected foward. The squared spot on the beam is your proof that all available light is being used and there's no peripheral projection. It's a true collimated beam that cuts through thick smoke, dust, and the darkest abyss. Recoil LED Technology.® Think of it as a lighthouse in the palm of your hand.